Before I proceed, can I admit to having made a doily without losing my cool? Would it sound more hip if I call it a table mat? Oh wait, did I just lose more cool by using the word hip? Ack, I'm just going to risk it and go ahead with doily. 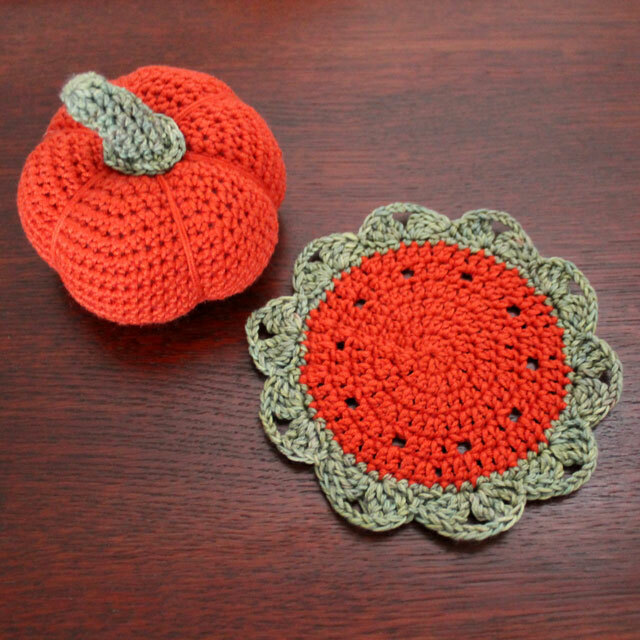 Here are a couple of small crocheted pieces I made this week, inspired by the season - A Pumpkin and a Small Doily. 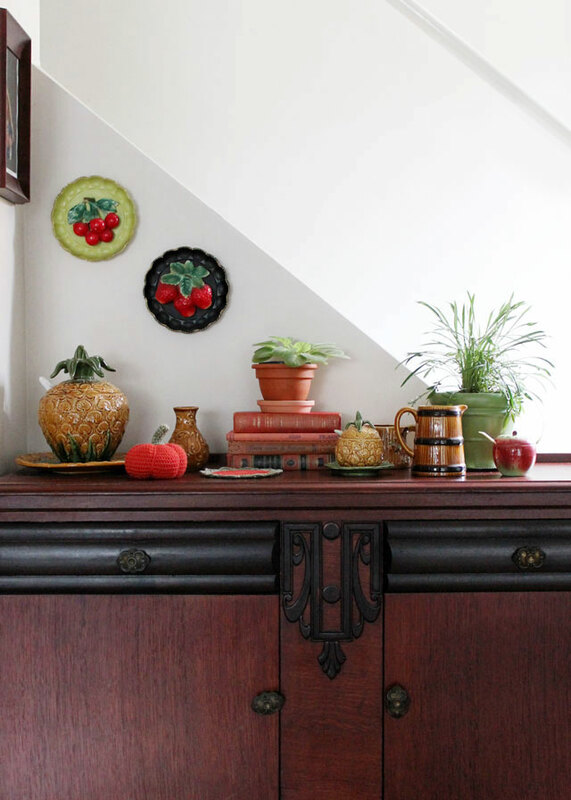 I displayed them a side-cabinet in our living room, among my collection of Majolica-Like Pottery pieces. Nick started this collection actually, after he brought home the big pineapple. He bought it at a garage sale held by our sweet elderly neighbour, who was moving. I actually thought it was fugly at the time and didn't know where to put it, but it grew on me. 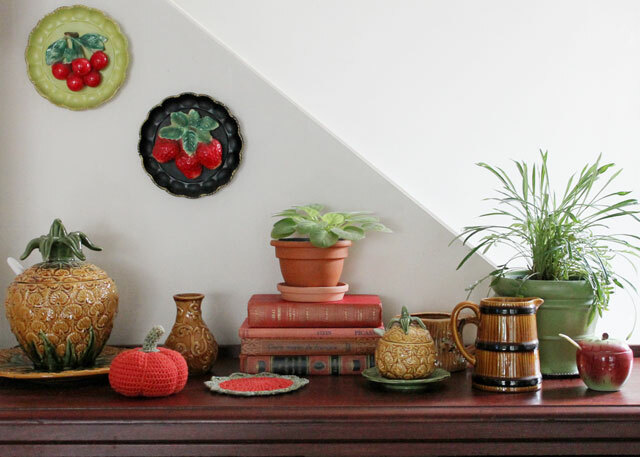 Then when I found the other pieces on ebay and thrifting (see this post) I decided to embrace the big pineapple! Also included in the display are some vintage books, my favourite of which is a 1946 copy of Gertrude Stein's 'Picasso', complete with colour plates. The plants are the little African violet you've seen before, and the Gazania I brought in from outside. It is all all done flowering and most people would be tossing this annual into the compost pile at this point but I like its spikiness and thought I'd bring it in to see if it will survive. The apple jam-jar is a vintage piece I got from ebay, especially for a visit from Nick's parents shortly after we were first married. He and I are not jam eaters but they are so we 'needed' it. Now, every time I take it out it gives me fond memories of his lovely parents, who live too far away. 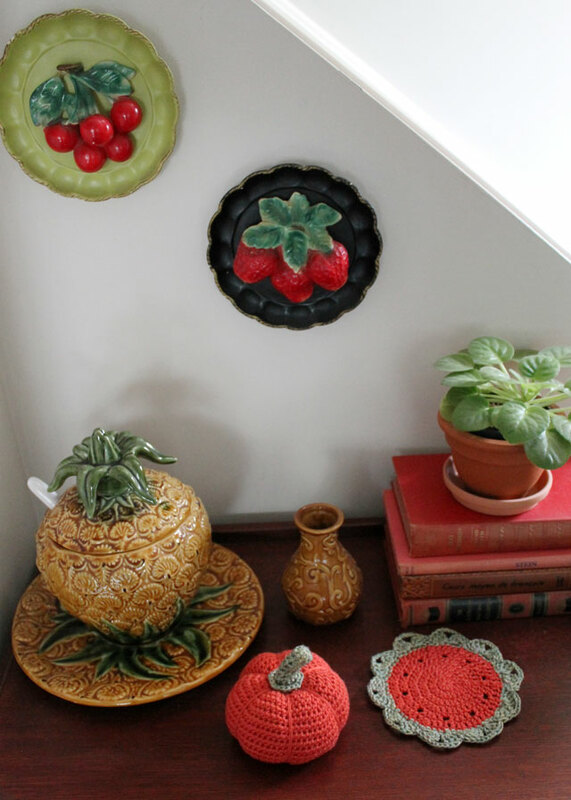 The vintage chalk-ware fruit wall decorations are also something I found on ebay a while back. I am no pro pattern writer but I thought I'd give it a go for any fellow crocheters reading. These are the first patterns I've ever written out so I hope they make sense. (1st row) Start with a Magic Ring, chain 1 and make 7 hdcs into the ring. Slip stitch to close. (2) Chain 1 and make 1 hdc at the base of chain. Then make 2 hdcs into each stitch in previous row (16 stitches). Slip stitch to close (do the slip stitch to close each row). (3) Chain 1 and hdc into base. Then alternate 1 hdc in next stitch and 2 hdc in the one after, all the way around. (4) Same except alternate 1 hdc in next two stitches and 2 hdcs in third stitch, and so on all the way around. (5) Same except alternate 1 hdc in next 3 stitches and 2hdcs in next stitch, all the way around. (6) Are you starting to see the pattern? You got it, for this row, it's 1 hdc x 4 stitches and then 2 hdcs in the next. (9-13, for 5 rows, but you can do more if you want a taller pumpkin) 1 hdc into every stitch. See how your piece has become bowl-shaped? (15th row) '1 hdc x 5 stitches and 1 decrease stitch, pulling the next two into one' (16th) '1 hdc x 4 stitches and 1 decrease stitch, pulling the next two into one'. And do on until you're left with a small opening. Fill your ball with stuffing and close up the hole by continuing the sequence. To shape and make the groves in the pumpkin, take a length of about 60 inches of yarn and thread it onto a tapestry needle. From the bottom to the top, sew through the middle of the ball (leaving a 4 inch tail that you'll hide at the end). Come out the top and go around to the bottom again, and right through the ball again. Tighten it a bit to make a grove. Go all the way round for a total of 6 times (making 6 'sections' in the pumpkin. Go around one more time and then play with it until you're happy with the shape. Then remove the needle and tie the end of the yarn to the tail so the knot is as close to the pumpkin as possible. Thread both ends onto the needle and pass it into the pumpkin to hide them inside. To make the stem : With green or brown yarn, make a magic circle. Make 10 hdcs into the ring. Then just hdc into every stitch, around and around, creating a tube. Make it as long as you'd like and finish with a row of 2 hdcs in every stitch (to make it flare out a bit). Stitch the stem onto the pumpkin. Gently toss the finished pumpkin at your husband's head ... kidding ... just seeing if you're still with me. I used a light weight worsted yarn that is a bamboo/wool blend and a 3.5 mm hook, but anything will do. 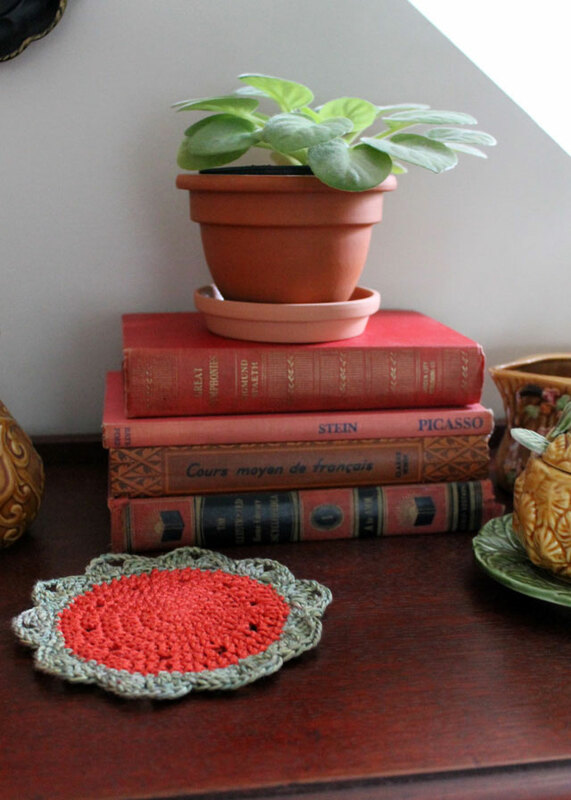 A thicker yarn will just result in a larger doily. To make sure you're lining things up correctly, note that each set of 2 stitches lines up with the set from the previous row. (1st row) Make a magic ring. Chain 2 (counts as the first stitch) and make 9 Double Crochet Stitches into the ring (total of 10). Close with a slip stitch. (2) Chain 2. 2 dcs into each stitch in previous row, finishing by 1 dc at the base of the beginning chain (to make a 'pair' of stitches) 20 stitches total. Close with a slip stitch. (3) Chain 2. * 1 dc into next stitch and 2 dcs into the following one *. Repeat from *. Finish row with 1 dc at the base of the beginning chain and close with a slip stitch. 30 stitches including 1st chain-2. (4) Chain 2. * 1 dc into next 2 stitches and 2 dcs into the following one *. Repeat from *. Finish row with 1 dc at the base of the beginning chain and close with a slip stitch. (5) This is the row with the 'holes' in it : Chain 2. * 1 dc into next stitch, chain 1 and skip a stitch (making a 'hole'), 1 dc into next stitch, and 2 dcs into the following one *. Repeat from *. Finish row with 1 dc at the base of the beginning chain and close with a slip stitch. (6) Chain 2. * 1 dc into next 4 stitches, going into the 'hole' when you get to it, and 2 dcs into the following one *. Repeat from *. Finish row with 1 dc at the base of the beginning chain and close with a slip stitch. Fasten off and change colours if you'd like. (7) Chain 2. (Note we've changed to Single Crochet stitches for this row.) * 1 sc into next 5 stitches and 2 dcs into the following one *. Repeat from *. Finish row with 1 dc at the base of the beginning chain and close with a slip stitch. (8) This is the Scallop Trim row. Do not begin by chaining. After your slip stitch, skip 2 stitches and do 3 Treble Crochet stitches into the third. Chain 4. Do 3 Treble Crochet stitches into the next stitch. Skip 2 and slip stitch into the next. You've created your first scallop. Repeat all the way around. You should end up with 10 scallops, which line up with the 'holes' from row 5. Fasten off. 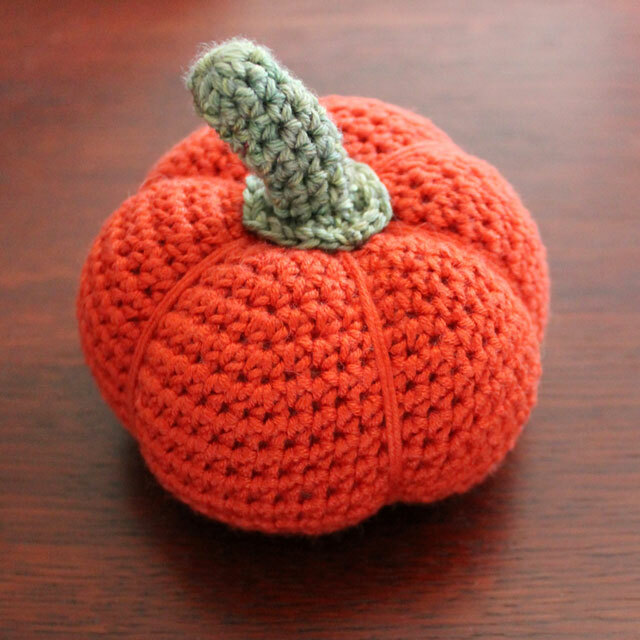 Follow up: Fall 2015 - The crocheted pumpkin was linked by Cindy over at Skip to My Lou Blog >> over here, where she thought that it would go well with some crocheted maple leaves. So I made some of the leaves and created a garland to prove her right! See that here. I love your creations. Thank you for the pattern&instructions. 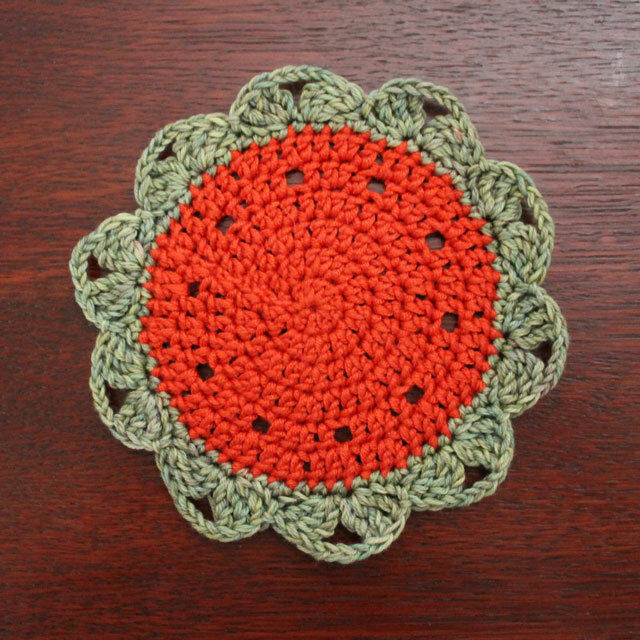 I still have not attempted to crochet any fruits/vegies, I am going to try this one. The photographs of the display is beautiful. 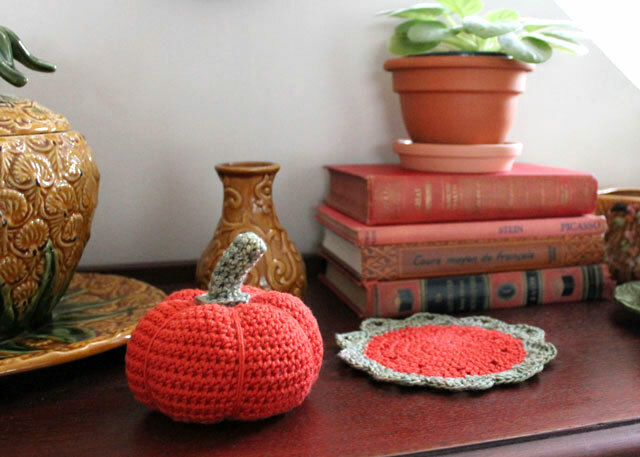 that crocheted pumpkin is so awesome, and it looks great with the doily amoung your seasonal goodies. 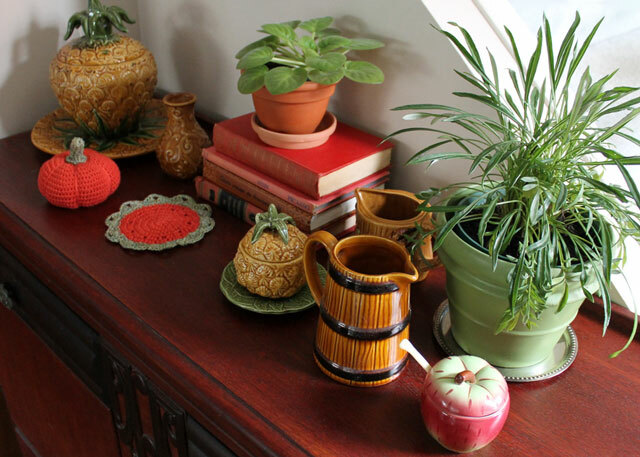 I love that apple jam pot, too! So glad it is infused with good memories. What a cute little thing! 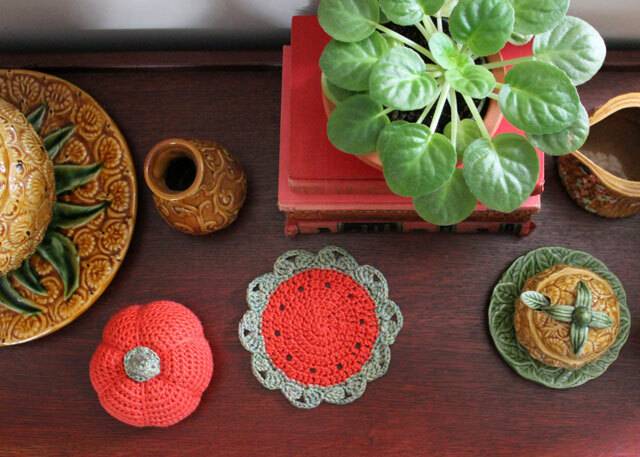 You’re the crochet queen! Hey that rhymed! The pumpkin is adorable, and I love the fruit decorations! Thanks Marieken. Yes, I have a thing for fruit, lol. 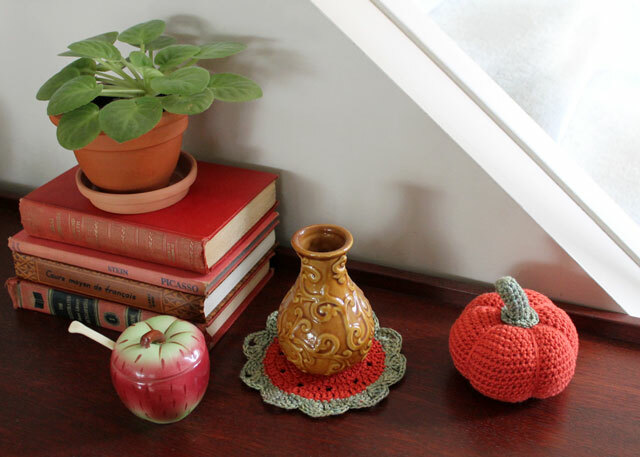 What beautiful autumn accents….I love the pumpkin!